Brad Look, Hollywood makeup artist extraordinaire, often found himself on the cutting edge of makeup technology as he worked on the hit series "STAR TREK - ENTERPRISE." 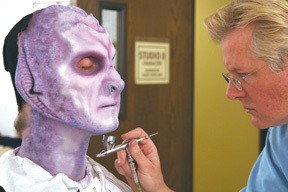 Here he applies Graftobian Air Brush Make-Up to complete an alien he developed especially for a Graftobian seminar he taught at a makeup artist trade show. "The key to creating believable makeup while airbrushing is to use freehand spraying to establish the forms of the character. Don't forget the use of color theory when exploring the creation of a character's makeup. Using cool colors for their shadows and warm colors for the highlights will give you a much stronger finished makeup. I'll use stencils when I need to repeat a given pattern to be reapplied to the same character each day, for several days, so that there will be continuity to the design. But as a general rule, I believe that freehand airbrushing gives a more organic look to the finished makeup."